Let us analyze this series of fake DMCAs and how it exposes the disregard for law of Anar Mammadov – Azerbaijan America Alliance. The fake DMCA was filed by our old friend, Jenethan Andersan. The genius working at an Indian Reputation Agency, who was outsourced this project by Anar Mammadov – Azerbaijan America Alliance. Here’s the backdrop for the story. The original news article was published at Azerireport.com which seriously hurt Anar Mammadov – Azerbaijan America Alliance’s reputation. That article was later discussed on a discussion board armeniandiaspora.com . All this happened more than 12-13 yrs ago (2006 to be exact). Now, the Reputation firm saw an opportunity when the original website Azerireport.com shut down in 2016. All they needed to do was to impersonate them and file a fake DMCA report which would have removed the only surviving copy of the article. Even though this falls under fair use policy, Google removed that content from it’s search results. However, we managed to get in touch with the original website’s owner and have since then confirmed that he had nothing to do with this fake DMCA. We have therefore filed a counter-notice on Google, as well as republished the removed article here in all it’s glory. WASHINGTON DC. December 7, 2011: The Hill publication announced the arrival of another Azerbaijani lobbying group to the DC. Anar Mammadov, a young son of an Azeri oligarch/transport minister Ziya Mammadov, established a non-profit organization called the Azerbaijan America Alliance. “Founded by Anar Mammadov, a young Azerbaijani businessman and son of the country’s transportation minister, the Alliance hopes to highlight the ties between Azerbaijan and the United States, whether it’s through energy or national-security interests,” reported The Hill. The Azerbaijan America Alliance is led by Anar Mammadov, Ziya Mammadov’s son and the chairman of the multi million dollar ZQAN Holding, and one other person – Khayal Sharifzade. Khayal Sharifzade is the board member of the ZQAN Holding and the former CEO of the Bank of Azerbaijan. On the surface, the new lobbying group is aimed at counter-balancing the Armenian lobby organizations. However, the establishment of this “anti-Armenian lobby” organization coincides with the time when nothing significant is happening on the frontlines of the diplomatic standoff between Azerbaijan and Armenia, while at the same time a lot is going on a completely different field. A new wave of democratic movements is shaking the region in Azerbaijan’s neighborhood. Azerbaijan itself has seen rising tensions as the democratic forces in the country started challenging the Aliyev regime more aggressively than ever since April this year. of misdeeds in Anar Mammadov’s young, yet eventful life (Azerireport). 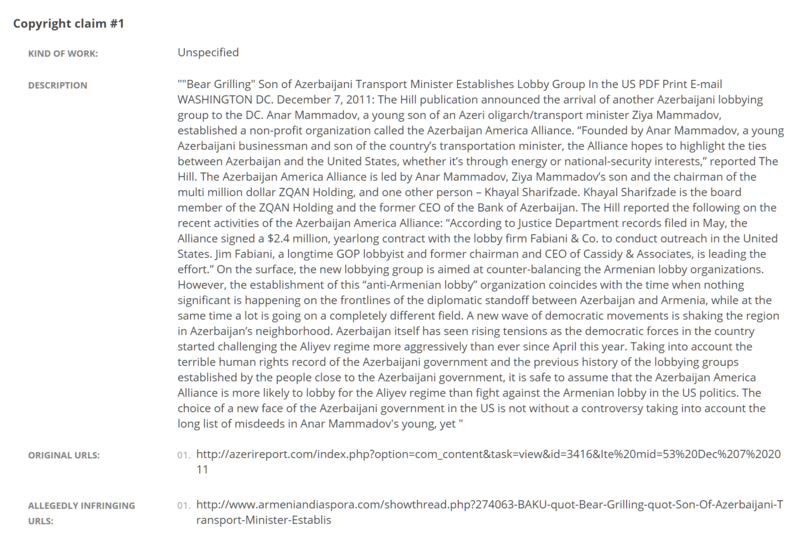 This complaint and/or review was posted on Webactivism.com on Oct 08, 2018 and is a permanent record located here: https://www.webactivism.com/anar-mammadov-azerbaijan-america-alliance-investigation-for-fraud-impersonation-and-perjury-fake-copyright-takedown-scam/. The posting time indicated is Central Standard Time. Furthermore, Webactivism.com has an exclusive license to Anar Mammadov – Azerbaijan America Alliance investigation. It may not be copied without the written permission of Webactivism.com. This investigation on Anar Mammadov – Azerbaijan America Alliance is submitted and written by one of our member. Any and all opinions and information are published as is. We does not edit or remove any aspect of the report and is merely a free-speech platform. As such, we cannot be held liable for the investigation reports and articles posted about Anar Mammadov – Azerbaijan America Alliance.